As a teacher, I am cautious about the messages the books in my classroom library send to students. Just as I don't want my shelves to be full of lovesick, helpless female characters, I don't want them to be full of overly macho, emotionless male characters either. I recently wrote about 8 realistic fiction titles to recommend to teenage boys that portray a variety of male experiences. 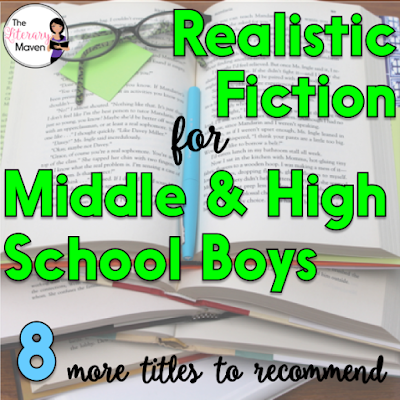 Here's 8 more titles, separated into middle school and high school, that I've recently read and would recommend for boys. Click the title of each to read my full review and ideas for using it in the classroom. The novel alternates between the present action, Liam lost in outer space with four other children, and the past events leading up to his adventure gone wrong. Liam is frequently mistaken for an adult, which has its benefits, but when he wins a trip to ride an exciting new thrill ride, which turns out to be a trip into outer space, he may have finally let things go a little too far. The narrator, Castle, quickly grabs your attention as he reveals a traumatic incident involving his father in the first few pages and a chapter later strolls into a track practice and challenges the fastest runner, despite having never running track before. Castle doesn't claim to be fearless, but he is bold and unwilling to let others define him. The novel follows senior football star Jerry Downing as he navigates his "second chance." His mistakes and his chances to do things differently were always on his mind, which I think sets a great example for less than perfect teens. This novel is so much more than historical fiction. The narrator Monty is hilarious and the plot is full of adventure and action. There's romance, but also some mystery. The author even tackles issues of race, gender, and sexuality. A modern take on The Great Gatsby and set in high school. For anyone who has read Gatsby, the similarities are immediately clear, but for anyone who hasn't the story is just as enjoyable. The novel is narrated by Rick, but the focus is on the mysterious Jake who has just moved to town, takes up the position of snapper on the football team, and holds the wildest parties every Friday night. The book is written in a journal format by Tod as he sits in detention with his guidance counselor. He's a "bad kid" who loathes everything about the establishment of school and has quite the humorous way of describing his dislikes to his reader. Tenneyson, the protective, older by a few minutes brother, doesn't approve of the guy his sister Bronte is dating. Bronte's love interest, Brewster, has a bad boy reputation, but Tenneyson soon discovers while that perception is a misconception, Brewster does have something to hide.